Iraqi Soldiers, Generals Shift The Blame For Battlefield Defeats : Parallels A soldier blames poor leadership for the recent loss of Ramadi. A pair of generals blame everything from corruption to a lack of training and weapons. Will this ever be an effective fighting force? 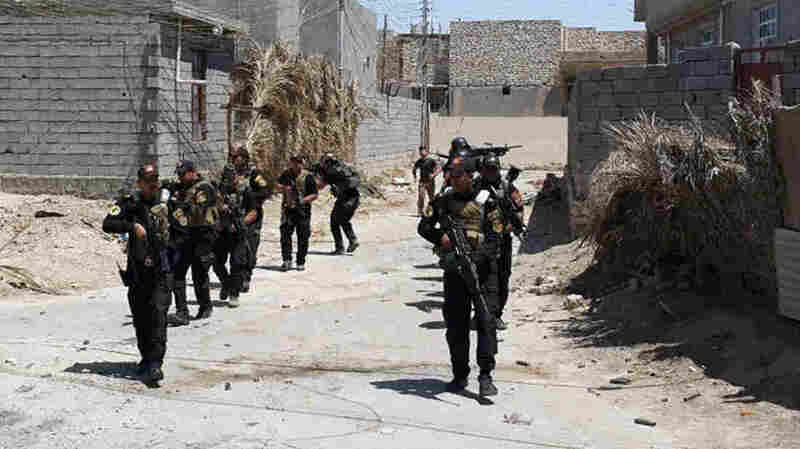 Iraqi forces deploy in Husaybah, several miles east of Ramadi, on June 14. The Iraqi army has performed poorly in the fight against the Islamic State, and soldiers and officers cite a host of problems. When the Iraqi city of Ramadi fell to the self-declared Islamic State last month, it was a big defeat. Ramadi is a provincial capital just 60 miles west of Baghdad, and the setback played into the notion that the Iraqi army is weak and inept. The U.S. Congress and Pentagon were scathing, saying the Iraqi army lacked the will to fight. There were plenty of other critics as well, though we haven't heard much from the Iraqi soldiers themselves. The troops bristle at the criticism. One of the fighters, Walid Abdelhassan, says he was fighting in and around Ramadi for 15 months before the final advance of the Islamic State, or ISIS. "We were under heavy attack for four days — severe attacks by ISIS — artillery, mortar rounds, different types of car bombs," he says. Abdelhassan is a compact man, tense and twitchy. This assault was bad, he says, but the Iraqi force had fought off worse and managed to hold on to the city center. He was surprised when the troops got an order to withdraw with a notice of just 30 minutes. Iraqi Sunni volunteers take part in a graduation ceremony at the Habaniyah military base near Ramadi on June 17. 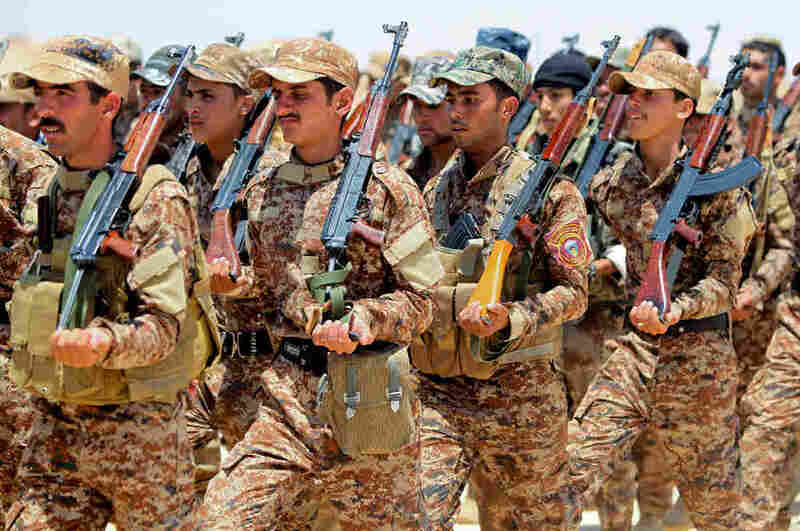 Iraq's military is dominated by Shiites and is trying to recruit more Sunni soldiers. "In half an hour we couldn't do anything, couldn't take our cars, ammunition, or even the corpses of dead soldiers with us," he says. The commander who gave that order is no longer leading operations and an investigation is ongoing. But Abdelhassan says this wasn't unusual. He gets a lot of orders that make no sense to him. "They don't think properly. They had us as a defensive line, never attacking," he says of the commanding Iraqi officers. Abdelhassan says the troops didn't have enough ammunition, that they were sitting ducks and a lot of men were killed. But he insists the one thing they didn't lack was the will to fight. His unit is still near Ramadi, in fact. To meet some of the senior officers, I visited the 6th Division headquarters on the outskirts of Baghdad. A minibus playing patriotic music carries me inside the wire. The commander's bodyguard unit practices marching in formation outside, and when I sit with the deputy commander, Staff Gen. Hussein Mashi, he says he didn't appreciate the American criticism of the army after the fall of Ramadi. "The Iraqi army is a good and an old army. We don't need anyone to evaluate us; we can evaluate ourselves," he says. But the general concedes that since the withdrawal of U.S. troops at the end of 2011, the Iraqi military has struggled. "We have shortage in intelligence, training and arming, and delays in supplying the Iraqi army with what they need," he complains. When the Americans were in Iraq, they prepared 100 Iraqi trainers for this division alone. So why would there be a lack of training? The general says they don't have enough weapons — and they can't train properly without weapons. He blames the Americans for this, too. 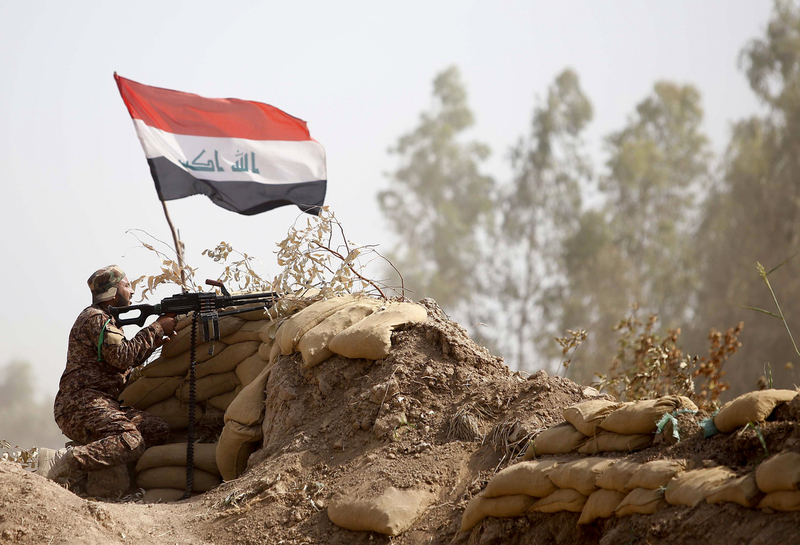 An Iraqi Shiite militia fighter holds a position in Salahuddin province, north of Baghdad, on May 26. With the Iraqi military performing poorly, militias have played an increasingly important role in the fight against the Islamic State. In a separate interview, the head of the air force, Gen. Anwar Amin, says the problem in the army leadership is creeping corruption. "If you don't take care, if you're not in control, the corruption ... will be like the cancer," he says. He makes the point that organizing training is harder for the Iraqi army than for most. It has basically been fighting a war against insurgents for a decade. He also says the army must teach soldiers that their Iraqi identity is more important than their ethnic or sectarian one. Abdelhassan, the soldier fighting in Ramadi, says he's fighting because his religious leaders told him to, rather than because he believes in the army. Amin, the air force general, says getting men like him to be loyal to Iraq won't happen immediately. "This is not easy to control all things immediately, it will take time," he says. But the Iraqi army's been trying to rebuild for more than a decade. Right now, ISIS is 30 miles away from Baghdad. And so the army's getting help — from a motley group of militias. The militias also oppose ISIS, but some of them are on the U.S. terror list. That doesn't bother Gen. Amin. "In reality they are like one team. They are working together," he says. His air force supports both the army and the militias. Iraq's regular forces need all the help they can get.